Provide you child with an academic-looking design of the Louis Philippe II Full Sleigh Bed in Black by Acme Furniture that is contemporary and elegant. The footboard and headboard have a curved design that enhances the trendy look. 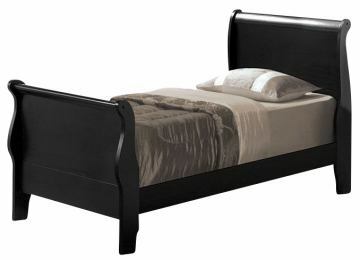 The bed features a black finish to spruce up your decor and uses solid wood for durability, while various sizes will suit your needs! various sizes will suit your needs!